This year, the big trend in music is a genre called dubstep. Like it or hate it, it has inspired a lot of musicians, and even more non musicians, to learn how to use their computers to produce music. "But I have these tiny hands." At first, I though I was following one of the piano tutorials correctly to create some Benny Benassi song that was remixed by Skrillex. Turns out that after I though I was baking a cake, I ended out with a roasted turkey dinner instead. (That's a good thing!) In retrospect, I'm glad I made those mistakes. I'm not a fan of Benny Benassi to begin with and the orignial song was so soft. The song I made was more upbeat, probably because I used so many 1/8th notes. At any rate, these mistakes were so worth it. Now keep in mind, this song I made was just to demo LMMS's capabilities to produce music. I didn't ad any special effects or make any edits. And because I'm only using a tiny netbook to do it all, don't count on me making any 10 minute songs. I'm considering using this song for a few demonstrations in the future than involve HTML5 Audio and Video elements. Here comes one right now. Your browser does not support the HTML5 Audio element. No sound for you! Feel free to download this song! Convert .ogg to mp3 then play it on the command line! I love using the command line music players, especially since I like using programs like tmux, vim and irssi. I'm of the opinion, the more command line stuff you use, the more you can remember and stay focused with coding projects. MOC (Music on Console) is pretty cool. But the default theme is a big blue nightmare. Forunately, you can change the theme and the programmers of MOC realized for a lot of folks, blue just isn't their color. The MOC themes are located in /usr/share/moc/themes/. You will likely need to create a config file. Using vim, create the file ~/.mog/config and write the following line. Then save the file and quit. You need to change the permissions of the new file. If you forget to change the permissions on the config file you will get a fatal error and MOC won't run. Change the permission of the file. After that, you can fun it any time with the second line. Save and quit. Read through my shell script for a few other instructions. Then run my program: ~/lastfm. This should start playing your radio station. For instruction using shell-fm type ?. Finally! That's everything! Enjoy your Memorial Day! One last thing before I close this post. Happy 101st Birthday to Vincent Price. 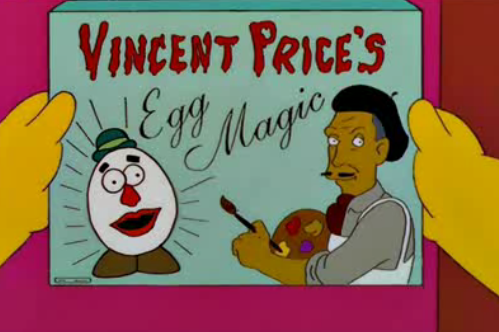 If Jody Price is reading this, you still owe me a pair of egg feet! "You should know that the grave can never tame me!"